For the longest time I had the idea of a forest-inspired wedding styled shoot which could be captured in photos and cinematic videography. When I found out Leozette from SA Weddings was thinking of the same concept, it was a sign from heavens! We quickly started planning all the details for our dream styled shoot. Being a model herself and a nature lover, Leozette agreed to pose for photos and cinematic videography. I needed three models, so Leozette’s gorgeous friends Yolande and Kirstin joined us for the shoot. We gathered at Hathersage in Somerset West, a lovely venue hidden amongst the trees. Our stylists created elaborate tables filled with decor, while the models were having their makeup and hair done. We had the privilege of hosting Craig and Nikki Fourie, the Mushroom Guru’s, who added some precious exotic mushrooms to our decor. Andre followed the stylists and the makeup artists around, capturing “behind the scenes” for cinematic videography. 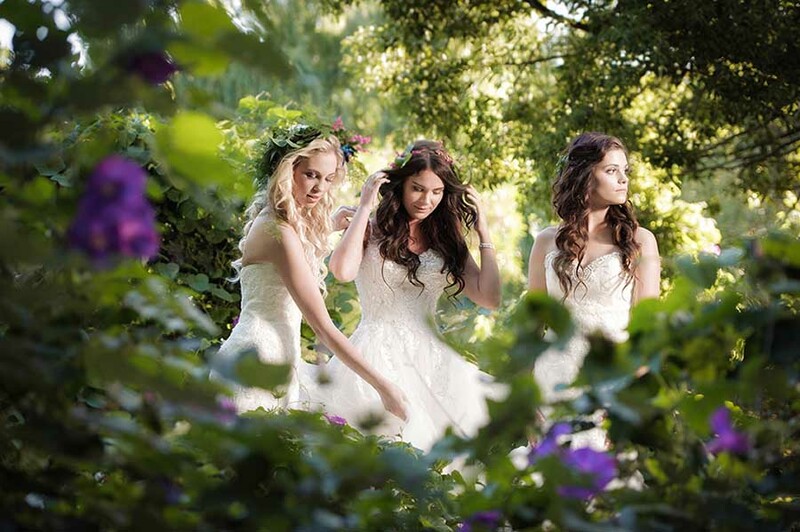 When our models were all done up in their Enzoani gowns and flower crowns, we moved to the garden for the main part of this fabulous styled shoot. Our friend Jean from Xplode Entertainment was there already with his smoke machine, to fill up the air with fog and create a dreamy atmosphere. The ladies enjoyed wearing their elaborate gowns and parading amongst the trees and fog. They loved spinning around in the smoke for our cinematic video! The last part of our styled shoot happened in the nearby forest. Brave Jean carried the Nimbus dry ice smoke machine all the way into the fields, to surround our models with clouds of thick, low-flying smoke. The smoke transformed rather ordinary woods into enchanted forest! The girls were fantastic, posing in the evening sun for this cinematic videography. They loved being princesses for the day and posing in Enzoani gowns. We all enjoyed this creative cooperation. Styled shoot cinematic videography captures the fun of collaborating with fellow industry creatives. Sometimes I feel like cinematic videography is more powerful than images, because it captures the excitement in such a unique way!